Carter set six NCAA, 19 Western Athletic Conference, and 24 school passing records in college. He was chosen by the Chicago Bears in the sixth round of the 1967 AFL/NFL draft and saw no action in his first year with the club. Carter got an opportunity to start in ’68 and led the Bears to four straight wins before suffering a broken ankle. While lacking a strong arm, he was mobile and rushed for 265 yards in addition to throwing for 769 yards and four TDs. However, he saw less action in 1969, voiced his displeasure, and was dealt to Buffalo in ’70, who in turn traded him to the Bengals. With Greg Cook, a sensation in his 1969 rookie season, sidelined, offensive coach Bill Walsh designed a passing offense that took advantage of Carter’s intelligence (he earned a master’s degree while playing for the Bears), accuracy, and mobility and compensated for his lack of size and arm strength. 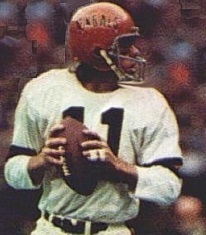 Operating in what would come to be known as the West Coast offense, Carter had a commendable performance as he threw for 1647 yards and 9 TDs and the Bengals, in just their third year of existence, came on strong in the second half of the season to top the new AFC Central Division with an 8-6 record. Bengals went 4-10 to finish fourth in the AFC Central. Carter gave way to the younger and more talented Ken Anderson in 1972 and saw limited action. He missed all of the ’73 season due to a preseason injury and was traded to San Diego in 1974, but joined the Chicago Fire of the WFL instead. Carter performed well, throwing for 2629 yards and 27 TDs, until his season ended after 12 games due to a hand injury that required surgery. He spent 1975 with the Chargers and returned to the Bears in ’76, in both instances as a little-used backup in his final two pro seasons. Overall in the NFL, Carter passed for 5063 yards and 29 touchdowns, giving up 31 interceptions, with 3850 yards and 22 TDs (against 20 INTs) coming with the Bengals.